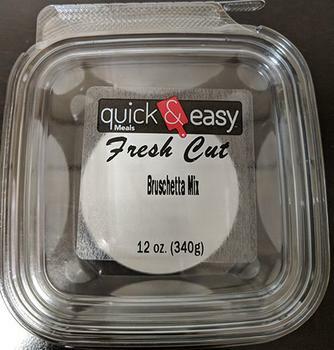 Cut Fruit Express of Inver Grove Heights, Minn., is voluntarily recalling packaged bruschetta mixes and dips. The products may contain soy and milk, allergens not declared on the label. The recalled products were sold to distributors or retailers in Minnesota. The distributors may have shipped the product to other states. Customers who purchased the recalled products should not consume them, but discard them or return them to the place of purchase for credit. Consumers with questions may contact the company at 651-438-8834.